November is a Great Month to Fish! Finally, cooler weather has moved into the Tampa Bay area and the water temperatures have dropped to the upper 60’s and this has had a huge impact on the concentrations of fish. When the water cools, fish seek warmth. 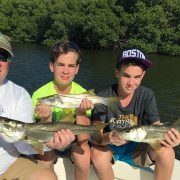 There are areas in the upper Tampa Bay regions that hold hundreds of snook due to the water depth and a muddy bottom that builds heat during the day and retains it overnight. Not only do these snook congregate in astounding numbers, they’re extremely hungry. 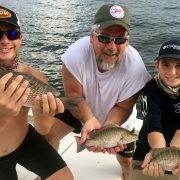 Once I set up to catch these fish, I chum heavily with live bait to activate the bite. After the snook begin to feed, which is usually only a matter of minutes, I start baiting hooks. Then it’s on like Donkey Kong! Most times, a snook will then take your bait as soon as it hits the water. Even beginner fly anglers can get in on the action, because it’s literally like shooting fish in a barrel. The good news is, this kind of non-stop snook catching last through the rest of fall and all winter long. 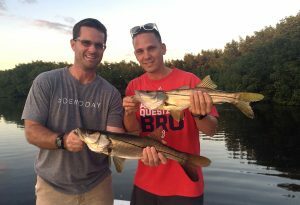 It’s commonplace for clients to catch 50 or more snook an outing. During the winter of 2015, four separate charters caught and released over 100 snook. Your party could be next! 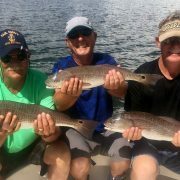 Not only are the snook huddling up, so are the redfish and trout. Occasionally, I’ll catch trout and some redfish in my snook spots, but usually I move to areas with deeper water. The deeper the water, the warmer. I still chum to get the action going, before baiting the hooks for solid hook-ups. Cooler weather has also ushered in the king mackerel, aka kings or kingfish. Kingfish are making their annual migration run along our coast as they head back to the Florida Keys for the winter. My favorite method for catching kingfish is slow trolling with live bait, which usually produces larger fish and is by far the most exciting. Many times, you get to watch the fish take the bait. Other times, a kingfish might skyrocket on a bait trolled in the prop wash. Many times, I get too busy to write fishing reports as often as I would like. So, if you’re interested in seeing my most recent post, please like my Facebook Page to receive updates. 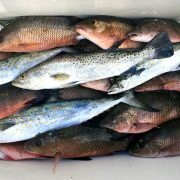 For charter reservations call/text Wade at 813-286-3474.
https://www.afishionado.com/wp-content/uploads/2017/11/November-17-Report-Photo.jpg 1313 1920 wpfishwade https://www.afishionado.com/wp-content/uploads/2018/03/afishionadoheader2.jpg wpfishwade2017-11-03 10:47:142018-02-13 10:07:48November is a Great Month to Fish! 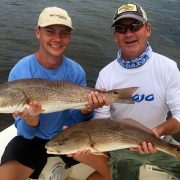 Tampa Bay Summertime Fishing is HOT! 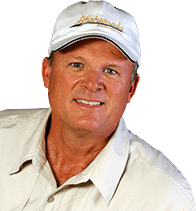 You can't pick a better fishing guide! The Catching is Hot Right Now!